– Is All Of This More Evidence ‘The Big One’ May Be Coming Soon? 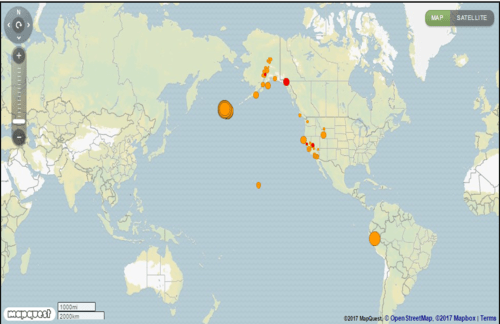 A visit to the live earthquake map ast the Global Indidents report finds much of the entire eastern half of the ring of fire littered with quakes over the past 24 hours as seen in the screenshot above with two large ones just southwest of the long dormant Tanaga Volcano in Alaska headlining the recent string of quakes. As Strange Sounds reports in this recent story, the Tanaga volcanic complex hasn’t erupted in more than a hundred years, dating all the way back to 1914, are these latest eruptions more signs that a major quake is in our future? The new story over at CBS Evening News reports shark attacks along the California coastline are on the rise with increasing numbers of shark sightings recently, most of them young great whites according to their story. As Steve Quayle mentioned in the SQnote he left while linking to that story, "when you see sharks schooling along the West coast ‘en masse’, know that ‘the big one’ is near!"